Happy First Day of Spring everyone! Today I bring you a Springy project, I call it 'Beautiful Beginnings', which, I will be submitting to two challenges. This month's Canvas Corps Brands (CCB) March theme challenge is "Rebirth" #ccbchallenge, celebrating Spring. 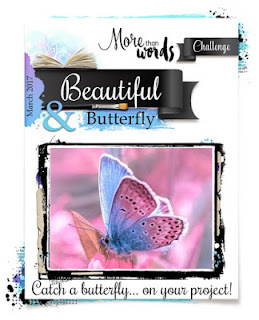 Over at More than Words, the March Challenge is "Beautiful and Butterfly". Taking these two themes together, made me think more about spring as well as getting warm, being that's still cool out east. So Spring is the season of rebirth, which not only gives us beautiful flowers and plants, but also that feeling of hope, pureness and renewal. I was looking through the products on the CCB site. The soil illustration on the Mixed Media Origins Bloom Mistable paper caught my eye. It prompted a surreal like imagery in my mind. I imagined flowers and plants coming out of its carefully arranged opening to the outside world. So, I decided to attempt to create my Spring project with a little sense of surrealism using a zipper. For my project I made a collage using fussy cut images from the Tattered Angel Mixed Media Origins Mistable Paper - 'Blooms' and 'Harvest Moon' #tatteredangels and CCB Spring Showers Papers- 'Spring Garden', 'Spring Flowers Reverse on Ivory' and 'Butterflies on Ivory'. To color my piece I used Glimmer Mists; 'It's Yellow, 'English Ivy' and 'Capri Blue'. For the soil I used Chalkboard Mist 'Decandence'. Wanted to add more of a soil like texture; with a palette knife I spreaded Golden Matte Medium Gel on the soil image. Additionally, I used several layers of Golden glaze with Decadence and 'It's Yellow' mists and because the Gel medium and glaze are clear, it allowed the illustration's soil cracks to show through, providing depth, which I like. On the 'Blooms' paper, I cut the opening for the zipper, then glued the paper down to the canvas, excluding the zipper's opening. The zipper was glued next, then glued down the the opening. Hope you enjoyed my project. 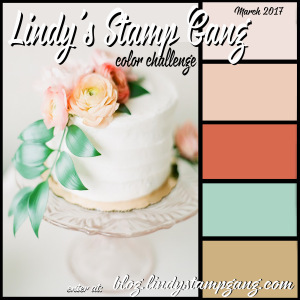 For the month of March, Lindy's Stamp Gang the color challenge features beautiful corals, green and beige. I was so torn as to what I wanted to create because so many springy things came to mind, specially with the snow we've been having (at least in the east coast). So I created my very own spring flowers in a bottle, no message in it though. Unless, this piece speaks to you, lol! Hope you enjoy it. For this project I used all the colors from the Lindy's Stamp Gang March 2017 Spray Set. I started out by covering the entire bottle with white tissue paper and gluing the zipper. The top layer is wrapped in beautiful handmade paper (purchased from the art store), it's thicker and finer than the regular tissue and will stand up to the sprays really well. The bottle was colored with Merci Beaucoup Mint and Kissin' Kenickie Coral. The flowers are made of paper and were store bought. and used all the colors from March Spray Set. The butterflies are made of paper; used copper wire for the antennas and dimension paint for the body and have been colored with Merci Beaucopu Mint, Cape Cod Coral and Clam Bake Beige sprays. The lace was colored with Cape Cod Coral. The stopper is a door knob that I got from the $1.50 bin at the craft store. The knob has a long screw. I screwed the knob into a cork and stuck it back into the bottle. Today I bring you my Design Team project for our 15 Mar Monochromatic Challenge at Colorful Creations, Laugh as Much as you Breath Mixed Media canvas. This piece was inspired by our theme. To me working in monochromatic colors brings a sense of emotion and the color gray came to mind. I believe gray can bring about a sad, somber, pensive and reflective feeling. 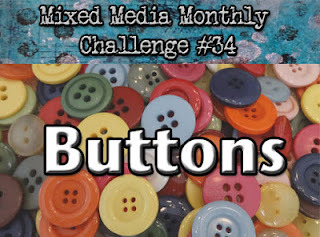 Join us on this challenge at Colorful Creations. All you have to do is select any color you want and stick to that color for your entire creation. Visit Colorful Creations site for more information and learn about the prize. Today I bring you chaos. I would like to share my wee-bit assemblage. This piece was inspired by life, lol! I got to thinking how we always feel we don't have enough for this and the other. Or we say, we are going to something when I...(make more money, get a new job, etc.) and that time never comes. Such is the journey that we are on together. Time is the only thing we could never get back, mass produce, touch it, or feel it. Thinking about all this....I don't know...one day I started to cut my watch faces (I tore apart several), I was saving for jewelry making, ha! ha!. My portrayal of clock faces being torn apart, clock hands and gears being strewn about and wings (time flying away from us) is my representation of the frustration with time construct. Okay, I am getting off my soap box (assemblage box, in this case). So I started this piece a while back. Recently, I was looking for challenges. The challenge themes for March on various art blogs, inspired me to finish this piece. I was inspired by the Creative Embellishment flying theme for this month. I was also inspired by Emerald Green Creek theme, use Splatter on your project. Not crazy about splatter on my art pieces, never done it. I like how some people use it on their pieces though. Then I got to thinking that it adds to the chaos, time destruction theme I have going on, I like it. For this month, Vintage Journey is celebrating their third year. So the theme is "All Aboard", referencing life journey, or other thoughts of journey. Were on this journey together, called life. I used a Tim Holtz Ideology Vignette Box, used the 3" X 2" box from the set. I used brown and gray acrylic paint. I then used paint then wiping off type technique, adds to the cool aged effect. I used Tim Holz wings. The gears are a combination of Tim Holtz, Creative Embellishments, and Finnabair; I like the variety together. The clock face and hands, tiny clock gears were bought on Etsy. The frame and base for the clock is made out of Polymer clay. All the embellishments were painted with black gesso paint, then treated with Gilders Paste Waxes; German Silver, Foundry Bronze, Silver, and Bronze. Used a high flow antique gold paint for the splatter. My posting today is unique because, this time, my make is jewelry. I like to dabble in jewelry making using found objects, stringing, beading and soldering. 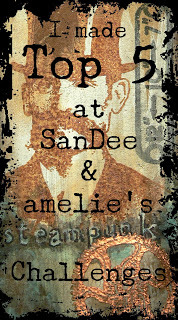 I don't do a whole lot of it because I am torn between working on Mixed Media projects and jewelry. Finnabair & Friends Open Studio Facebook has a challenge every month called Designer's Fave Challenge. For March, John Creighton Petersen, from Art New Wave is the Designer heading up the challenge and the theme is handmade jewelry. I made two pendants, one named 'Steampunk Bird' and the other named 'X Marks the Spot' using, both Finnabair Mechanicals, other hardware and clay. The idea behind this piece is that the nest and leaves are made of high tech metal with rivets, vice being made of natural twigs and leaves because in the post apocalyptic world and there are no trees. The base is a Finnabair Mechanicals Filigree. The nest is a lamp check ring, found at my local hardware store. The bird and eggs is made using Polymer Clay. The little leaves are store bought findings. Everything was treated with Christi Friesen Swellegants. Copper Paint, and Tiffany Green were used on the nest and bird. The eggs were treated with Brass paint and Gold-Green/Verdigris Patina. The filigree (the base) was painted first with Finnabair Heavy Black Gesso, then treated with Swellegant Bronze paint and Gold-Green/Verdigris Patina. What I love about Swellegant is the matte, aged effect metal finish it creates. I used Finnabair Mechanicals and gears. No glue, findings, bails or tools was used for this piece, just the Mechanicals, leather cord, and weaving some X's and knots. The pendant was treated with Christi Friesen Swellegant, Brass paint and Tiffany Green Patina and tinge of copper wax on the high rise surface areas. However for this piece, I used way more Patina that I did for the bird pendant, so that is why you see more of the copper patina effect. Whereby, for the bird and nest, I used way more copper paint. 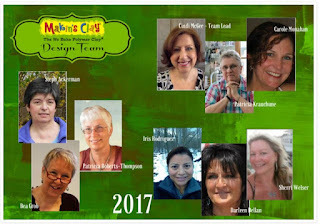 Today I bring my Design Team project for our 1 Mar challenge at Colorful Creations, Always Wear Your Invisible Crown Mixed Media. I like this quote, I find it motivational. To me it says simply says to have confidence in yourself. 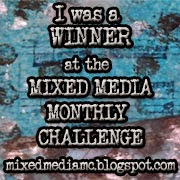 For the March 1st Challenge take a look at the picture below as it has color combinations. You are to use the colors you see. 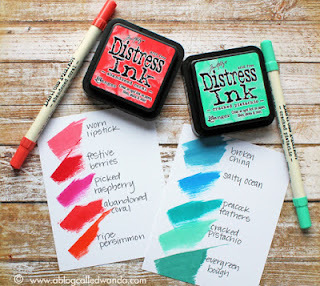 THE TWIST is that you also have to use some sort of ink on your layout whether it is from an ink pad, pen, marker paints you choose which medium just as long as we can see the color combination. 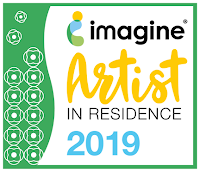 Visit the Colorful Creations Site for more details on the challenge. Have fun being creative and using some bright bold colors!